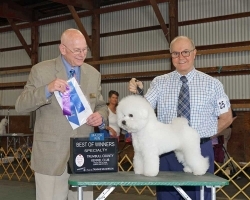 Best of Winners from the 9-12 puppy class at the Western Pennsylvania Bichon Specialty. Athena and Morris Litter Litter was born on 12/31/17. Our Molly and Rosinni Litter was born on 10/26/17. 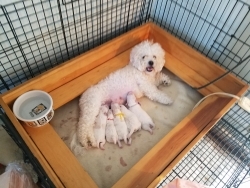 Our Lola and Quin litter was born on 6 2 17. They are all sold now and all the pups have gone to their new homes. 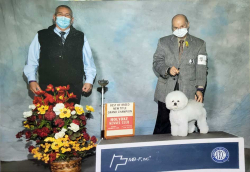 At the NJ specialty in March 2017 Casey had a major win on his first show. He has a great show career ahead. 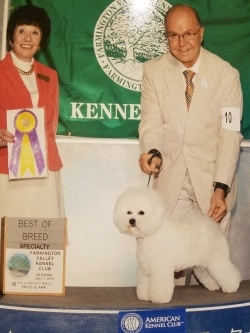 "CH Whitebred Pebbles Little Bamm Bamm"
Copyright © 2019 White Bred Bichons. All Rights Reserved.